● Fits the 30-week academic year at colleges and universities. The English Course is an integrated lower intermediate English language course for students from false beginner to lower intermediate levels. 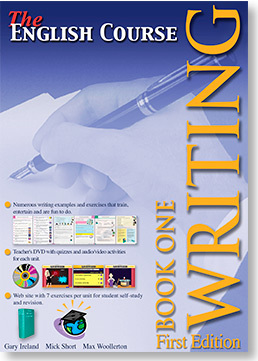 Writing Book 1 comprises a textbook, a teacher’s DVD with quizzes and audio/video activities, and a self-access web site. Writing Book 1 is principally intended for young adult learners at college or university level. The aim of the course is to balance extensive guided writing practise, through numerous textbook exercises, with cutting-edge technology for both classroom use and student self-access study. The units in the textbook cover a variety of writing genres and are designed to teach writing skills in a logical order, starting with basic sentence structures and building up to essay writing. 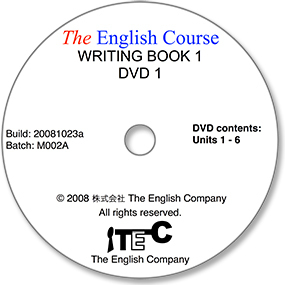 Each unit in the course includes the following: examples and several textbook exercises; two revision quizzes and an audio/video stimuli for the final assignment on the teacher’s DVD; and at least seven online revision/practice exercises on the student self-access web site, plus audio/video material for students to use. All units of the book share the same basic design, which is explained below. This consists of the unit title together with a list of the main objectives. A short section introducing the theme of the unit and key points. Short reading material consisting of explanation and examples concerning key points (grammar, skills, concepts) related to the focus or theme of the unit. Two or three follow-up exercises, varying in length and nature, that allow students to practise the grammar or writing skills introduced in the Input material. Questions or tasks to test students’ knowledge of the material presented in the first half of the unit, presented using multimedia in a game-like format, as an enjoyable way of doing further practise or demonstrating knowledge and understanding. Additional material on themes related to those covered in the first half of the unit. Questions or tasks to test students’ knowledge of the material presented in the second half of the unit, presented using multimedia in a game-like format as an enjoyable way of doing further practise or demonstrating knowledge and understanding. A writing exercise using multimedia that is a culmination activity for demonstrating knowledge of material covered throughout the unit and the student’s ability to produce writing related to the unit’s focus, themes or skills. Exercises online for student self-access practise and testing. Click on the images below to see sample material from a unit of the textbook and accompanying audio or video material. Click the picture of the book on the left to open and/or download a PDF file of Unit 4 from the textbook. Gary Ireland was born in Leicester, England, but has spent the last 29 years living in Japan. Having first visited Japan as a back-packer in 1986, Gary returned in 1988 and began to teach English at a language school. He taught at a wide variety of institutions before beginning to teach in college and university in 1993, and has taught at eight Tokyo colleges and universities since. Currently, he is a professor at a university in Tokyo. After graduating from university and before settling in Japan, Gary spent several years travelling around the world, and has continued to travel widely since moving to Japan. He has visited over 50 different countries in Asia, Europe, Africa, and Central America. Gary and Max created the idea for The English Course and set up The English Company in 2006. Max Woollerton is also British. He came to Japan in 1987 and began teaching English at a private language school. Within six months, he had moved on to working in a vocational college and was the coordinator for a course on current issues and a course teaching English for Special Purposes. Between 1996 and 1999, he broadened his experience by teaching students of every age and level in a variety of institutions. Max began teaching in universities in 1999 and has taught at eight Tokyo universities as a part-time instructor. In 2004, Max Woollerton gained a Master of Education degree at the University of Manchester (Education Technology and ELT Programme). Since 2012, he has been a full-time associate professor at Chuo University in Tokyo. Mick Short is from Derby in the U.K. He came to Japan in 1984 to work in a small English language school in Shibuya teaching English. Shortly after that he started working as an Industrial Designer for Seiko Epson and Ricoh. From 1994-95, Mick worked in Eigomedia (now eigoTown) as Art Director and Interface Designer, designing English language learning CD-Rom publications. Mick set up Mindstorm, a company that develops products, including those for The English Company. At various times in Japan, Mick has taught both English and Art and Design. He is currently Adjunct Professor of Art at Lakeland College.